Richard Clarke (left) spent almost two decades at Portadown under manager Ronnie McFall (right). Richard Clarke has called for Portadown fans to remember the glory days following Ronnie McFall’s resignation on Saturday after 29 years at Shamrock Park. 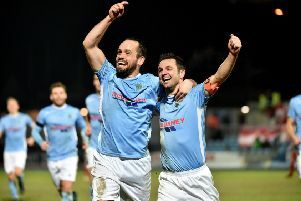 Clarke, the current Dergview manager, spent almost two decades under the guidance of McFall and together the pair celebrated league and cup triumphs. McFall stepped down as manager of the Ports in the aftermath of a weekend Irish Cup exit to second-tier Lurgan Celtic. As a result, it marked the end of McFall’s reign as the current longest-serving manager in European football. “I just hope that, once the dust settles, people look back on the great times,” said Clarke. “I also hope that Ronnie can reflect with pride on those glory days and not let the last few years of disappointment tarnish his reputation or legacy. “I have known him a long time and his public persona is very different to those who he trusts on a private level. “He is a nice man, a genuine gentleman. “I have kept in regular contact with him since leaving Shamrock Park and, on a personal level, Ronnie has done a lot for me over the years. Clarke was quick to place a portion of blame on the current playing squad for the manner of McFall’s departure. “From what I have seen and from talking to people around Portadown, there seems to be a real problem with fitness and attitude,” said Clarke. “The league position probably confirms that and I am sure Ronnie will feel disappointed in his players.